A: Although our inquirer refers to GIRM 137, the quote is actually from the Roman Missal’s Order of Mass 137. “163. When the distribution of Communion is over, the Priest himself immediately and completely consumes at the altar any consecrated wine that happens to remain; as for any consecrated hosts that are left, he either consumes them at the altar or carries them to the place designated for the reservation of the Eucharist. “Upon returning to the altar, the Priest collects the fragments, should any remain, and he stands at the altar or at the credence table and purifies the paten or ciborium over the chalice, and after this purifies the chalice, saying quietly the formula Quod ore sumpsimus, Domine (What has passed our lips), and dries the chalice with a purificator. If the vessels are purified at the altar, they are carried to the credence table by a minister. Nevertheless, it is also permitted to leave vessels needing to be purified, especially if there are several, on a corporal, suitably covered, either on the altar or on the credence table, and to purify them immediately after Mass, after the Dismissal of the people. “183. When the distribution of Communion is over, the Deacon returns to the altar with the Priest, collects the fragments, should any remain, and then carries the chalice and other sacred vessels to the credence table, where he purifies them and arranges them as usual, while the Priest returns to the chair. Nevertheless, it is also permitted to leave vessels needing to be purified on a corporal, suitably covered, on the credence table, and to purify them immediately after Mass, following the Dismissal of the people. “249. […] Moreover, the Deacon consumes at the altar all that remains of the Precious Blood, assisted, if the case requires, by some of the concelebrants. He carries the chalice to the credence table and there he or a duly instituted acolyte purifies it, wipes it, and arranges it as usual. “270. The Priest purifies the chalice at the credence table or at the altar. If the chalice is purified at the altar, it may be carried to the credence table by the minister or may be arranged once again on the altar, at the side. “278. 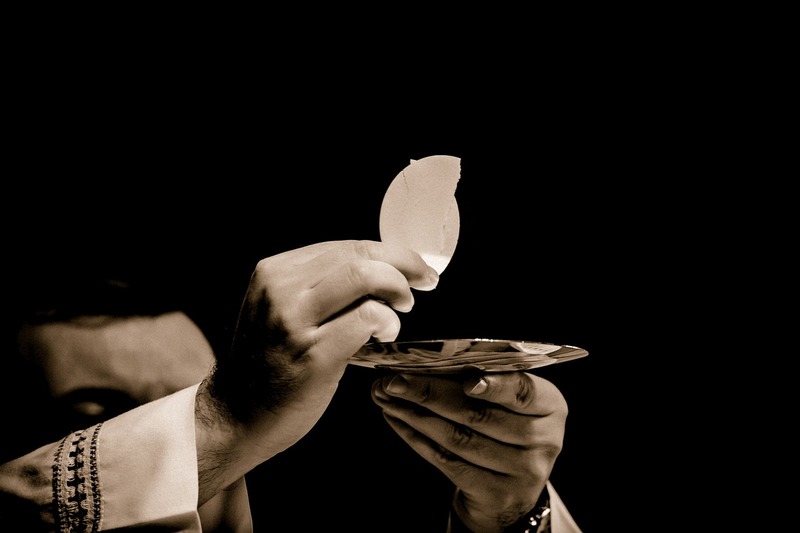 Whenever a fragment of the host adheres to his fingers, especially after the fraction or after the Communion of the faithful, the Priest should wipe his fingers over the paten or, if necessary, wash them. Likewise, he should also gather any fragments that may have fallen outside the paten. “279. The sacred vessels are purified by the Priest, the Deacon, or an instituted acolyte after Communion or after Mass, in so far as possible at the credence table. The purification of the chalice is done with water alone or with wine and water, which is then consumed by whoever does the purification. The paten is wiped clean as usual with the purificator. Care is to be taken that whatever may remain of the Blood of Christ after the distribution of Communion is consumed immediately and completely at the altar. Does this specific mention of the priest necessarily imply an intention to exclude the other possible ministers of purification from also praying it? — The exclusive mention of the priest is understandable in GIRM 163 as this number refers to the Mass celebrated by a priest with no other ordained or instituted ministers. — The rubric and the prayer were already present in the extraordinary form of the Roman rite at the time when only the priest would have purified the sacred vessels. The norm seems to have been carried over into the ordinary form without taking into account the subsequent norms enshrined in GIRM 279 which allow for other ministers to purify with no particular distinction, albeit with no mention here of the prayer. — The failure to mention the prayer is not evidence of the will to exclude the other ministers. It is frequent in the GIRM to give the most detailed explanation of a topic the first time it is mentioned and then touch upon it more briefly when the same topic comes up in a different form of Mass. For example, GIRM 183 summarizes 163 in the context of Mass with a deacon. Later, GIRM 249 is briefer yet when it outlines the process for concelebrations even though it is quite possible that a priest carries out the purification if no deacon or acolyte is present. Likewise, GIRM 270, which deals with Mass with only one minister present, also makes no mention of the prayer even though it is virtually certain that the priest does the purification. There is one point that should be considered, however. The text of this prayer implies having received Communion. This is certain in the case of the priest, as he is always obliged to consume both species. Although today, the deacon or acolyte doing the purification would almost certainly have received Communion, it is at least hypothetical that in some cases they might not have. In such hypothetical cases the prayer would logically be omitted.